I had the privilege to attend the wedding of one of my very good friends recently. This wedding is her second and she has finally, I believe, found her other half. He is a really great guy, from everything I have seen; and, they certainly deserve every happiness God can afford them. So I’m at the wedding, sitting close to the front. The wedding starts and the groomsmen come in to wait on my friend, the bride. Then I remember my pastor saying that in every wedding he does, he looks at the groom while everyone else is looking at the bride as she enters the room. I figure why not try it myself. I’ve seen what my friend looks like. I watched some of her pictures be taken after I helped set up the reception hall. When everyone stands to see my friend enter, I turn and look at her husband to be. I can tell the exact moment he gets his first look at her. His face turns bright pink; he bites his lip and closes his eyes. For a moment, he looks like he is either going to throw up or pass out. But when he recovers! He recovers and his face is filled with a love and pride I haven’t seen on any face other than my husband’s in a very long time. Then, it hits me. All through the Bible, God and Jesus are referred to as the Bridegroom of the nation of Israel and later all believers. Notable examples are Isaiah 62:5 and John 3:29. And all the times I have studied those verses I have concentrated on myself being the bride of Christ and preparing myself for Him. I mean I’m a woman; and, I was a bride about … years ago. (wink.) What is it like to be on the other side of that? 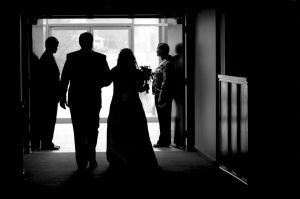 What was it like for my now husband to wait for me? Does Jesus wait with bated breath, so to speak, for the time to come where he gathers those that believe in him to Heaven? Is he going to have a similar look on his face when that time comes and the living and the dead in him are caught up in the air? I think so. I believe he is longing for us just as much, if not more so, than we are longing for him. He knows what is prepared for us in Heaven. He knows what it is going to be like when those who believe in him are all together in praise and worship. We don’t have that knowledge. We can only guess. And we’ve already been told that God does more ‘than we can ask or imagine’ (Ephesians 3:20). So, as I watch my friend approach her groom, relief builds on his face that they are actually together and will be until death. I take a moment to be thankful for my earthly groom of 18 years and for my heavenly groom still waiting for his ‘bride’ to be complete and ready for a time that is beyond death. The amazing thing will be that our heavenly bridegroom will have that look of pride and love for each one of us. Bring on the wedding, Lord! Just popped in to thank you for liking a post on Mama’s Empty Nest and landed on this post of yours. It truly is lovely. Last year, all three of my grown children married and at my son’s wedding, I watched him as his bride started down the aisle. He was overcome with emotion and choked back tears. The image of our Savior waiting for us – His bride – and welcoming us into His arms brings me to tears. His deep, deep love astounds me. Thank you so much for the kind words! I look at many of your posts through my reader, and go on. But your wordless wednesday this week was particularly striking. I have two sons, nine years old, and I am already praying for their wives. I want them to have to seek God’s heart to find hers.